1/55 Reagen Sulewski Michael Mann's best film to date, and that's saying a lot. A brilliant and moody thriller. 5/92 David Mumpower The best original screenplay of 2004 thus far. 10/48 Les Winan Tom Cruise needs to only play evil characters. Well made, interesting warning to the acting world of Jamie Foxx's impending arrival. 12/126 Kim Hollis Stylish as a Mann film should be, but also has the substance to back it up. Collateral tells the story of an LA cab driver who finds himself involved in something more than transit when what starts as a routine fare turns into the forcible chauffeuring of a contract killer to a series of hits. As the ride progresses, the cabbie realizes the killer is systematically eliminating witnesses to his crimes, and if the taxi driver wants to survive the fare, he will need to find a way to stop the hit-man. And soon. 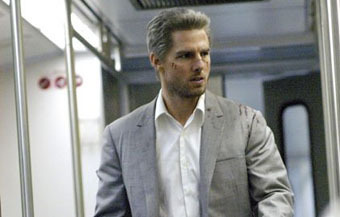 Collateral’s success or failure will hinge largely on two things: Whether audiences will believe Tom Cruise as a hit-man, and whether they buy the relationship between Cruise’s killer and Jamie Foxx, who will play the cabbie. Since the majority of the film will focus on the interaction between these two, the chemistry between Cruise and Foxx will be key. As for Cruise as an out-and-out villain, something he has rarely portrayed, the prognosis is somewhat murky. A lot will depend on how much of the Tom Cruise hail-fellow-well-met persona is incorporated into the role, but it is interesting to note that the films in which Cruise has assayed a less-than-pleasant character have consistently underperformed at the box office.